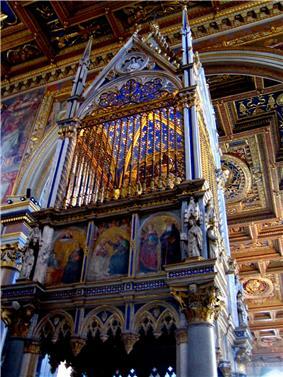 The ciborium over the high altar of St. John Lateran is derived from a design by Arnolfo di Cambio and decorated with paintings by Barna da Siena in 1367–1368. The cage above contains silver reliquaries which are said to hold the heads of SS. Peter and Paul. Arnolfo di Cambio (c. 1240 – 1300/1310) was an Italian architect and sculptor. Arnolfo was born in Colle Val d'Elsa, Tuscany. 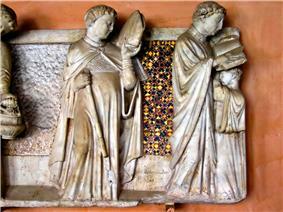 Detail of the tomb of Riccardo Cardinal Annibaldi, at St. John Lateran. This was the first major work of Arnolfo in Rome. He was Nicola Pisano’s chief assistant on the marble Siena Cathedral Pulpit for the Duomo in Siena Cathedral (1265–1268), but he soon began to work independently on an important tomb sculpture. In 1266–1267 he worked in Rome for King Charles I of Anjou, portraying him in the famous statue housed in the Campidoglio. 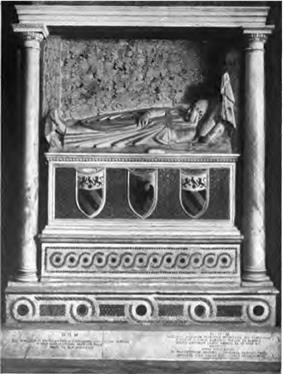 Around 1282 he finished the monument to Cardinal Guillaume de Braye in the church of San Domenico in Orvieto, including an enthroned Madonna (a Maestà) for which he took as a model an ancient Roman statue of the goddess Abundantia; the Madonna's tiara and jewels reproduce antique models. In Rome Arnolfo had seen the Cosmatesque art, and its influence can be seen in the intarsia and polychrome glass decorations in the Basilica of Saint Paul Outside the Walls and the church Santa Cecilia in Trastevere, where he worked in 1285 and 1293 respectively. In this period he also worked on the presepio of Santa Maria Maggiore, on Santa Maria in Aracoeli, on the monument of Pope Boniface VIII (1300) and on the bronze statue of St. Peter in St. Peter's Basilica. In 1294–1295 he worked in Florence, mainly as an architect. According to his biographer cathedral of the city, for which he provided the statues once decorating the lower part of the façade destroyed in 1589. The surviving statues are now in the Museum of the Cathedral. While the design of the Church of Santa Croce has been attributed to Arnolfo, this is highly disputed. Vasari also attributed to him the urban plan of the new city of San Giovanni Valdarno. The monumental character of Arnolfo's work has left its mark on the appearance of Florence. His funerary monuments became the model for Gothic funerary art. Giorgio Vasari included a biography of Arnolfo in his Lives of the Most Excellent Painters, Sculptors, and Architects. 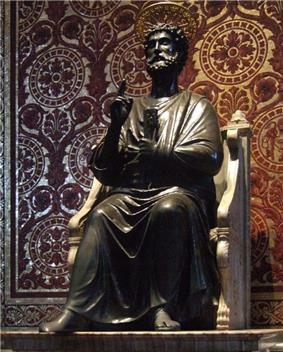 St. Peter Enthroned inside St. Peter's Basilica, is often attributed to Arnolfo. ^ The name "Arnolfo di Lapo" by which he is mentioned in some sources was an invention by his biographer Giorgio Vasari. See Tomasi, 2007. ^ The traditional date of 1302 has been recently discovered to be wrong. See Tomasi, 2007. ^ Roberto Weiss, The Renaissance Discovery of Classical Antiquity (Oxford: Blackwell) 1973:14 note 2. Arnolfo di Cambio in the "History of Art"